Geologically interesting Slieve Gullion was created around 65 to 50 million years ago. It is described as being surrounded by a ring of hills known as a ring dyke, essentially the extremely eroded remains of the caldera of a volcano which was about 11 km wide! It is really hard to do justice to the unusual experience of being on the summit (in good weather) with the ruined rim of the volcano all around you. 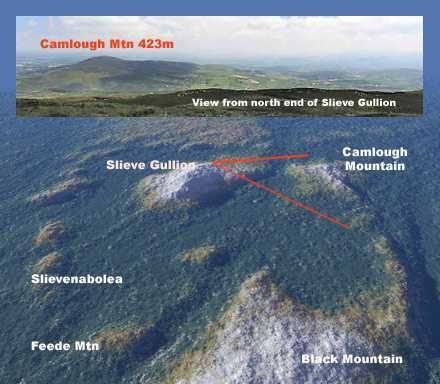 The illustration uses NASA data to create an overview and the picture shows what just one part of the view looks like from the summit, looking towards Camlough mountain. Like a number of the rim mountains this has an army base on it, to which in 2005 anyway, helicopters regularly fly in.